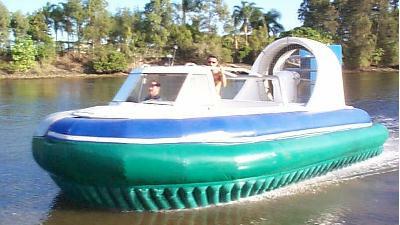 Guestpage for Airlift Hovercraft - Au. The Rivac AH680 is a tough ‘Work Horse’ style hovercraft which can be relied upon to work all day in harsh and remote environments. It has been designed for good load carrying capacity and durability while at the same time having low maintenance requirements. The low skirt pressure design makes the AH680RI less sensitive to skirt damage or terrain porosity. The semi-inflatable construction provides a large and stable work platform with excellent lifting capacity. For transport or storage it may be packed into a 20' shipping container. The inflatable collar provides a resilient buffer around the perimeter of the hull while the single diesel engine assures reliability and durability. A petrol engine may be fitted for increased performance and load capability if requested. Length 7.13 m / 23' 3" 6.80 m / 22' 2" 5.70 m / 18' 8"
Width 3.98 m / 13' 1" 3.30 m / 10' 10" 2.20 m / 7' 1"
Height 2.56 m / 8' 2" N/A 2.25 m / 7' 2"
Rigid Inflatable Construction, tough and resilient inflatable collar protects hard structure. Exceptional Payload Capacity, inflatable collar provides large lift area and improved earning capability. Low transport volume, able to be packed into a 20' shipping container, no wide load permits required. Simple Maintenance, only essential elements included in design. Minimum parts and systems to maintain in remote areas. World available industrial components used wherever possible. Simplicity in Operation, logical and simple controls, crew learning time minimized. Highly Stable, inflatable collar, high obstacle clearance bag and finger skirt. Quiet, large diameter thrust propeller has low tip speed, super quiet stainless steel exhaust system. 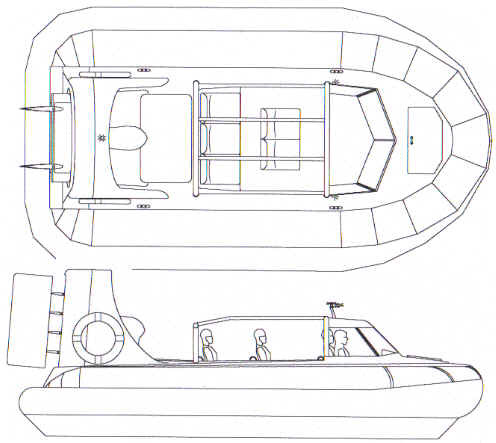 Safe, exceptional buoyancy, guarded propellers, 3 water-tight compartments in the hull, 4 separate inflatable bladders, safety frame over cabin area, fire zoning. Flexible Engine Selection, chose between petrol and diesel according to preference. Elegant concept, simple and effective, 'no frills'. Cockpit length 2.98 m / 9' 6"
Cockpit width 1.44 m / 4' 6"
Obstacle clearance 300 mm / 12 "
Lift & Thrust system Integrated ducted propeller, fixed pitch. This craft is replazing the modell " Mustang " . We hold the craft description still on file since several craft were build and are still in service.